Edition © 2000 by Whoosh! Editor's Note: As a fun exercise, Whoosh! each month presents a cartoon drawn by Nicola Guest and/or Marian Pappaceno, and then invites its readers to send in their ideas of possible captions for the cartoon. All the received captions (unless deemed too wild and woolly) are published in the next month's issue. Submissions must be received by the 20th of the month to be considered for inclusion in the next month's issue. 01. "But...I wanted a Billy Bass..."
03. 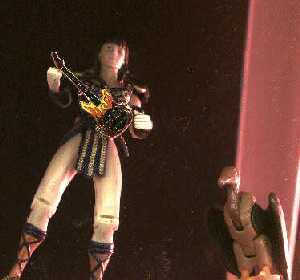 Xena: Gabby's always trying to symbolise our love in strange ways, but a Wrapped Trojan? Do we need birth control? Am I missing a joke here? Why is everyone laughing? Where's Argo? 04. Xena: Let me guess, this one is from Helen, right? 05. Xena: "What, you're telling me my present is the entire Greek army?" 06. "Gabrielle, that thing BETTER be full of Greeks, or YOU are gonna be riding it without a saddle!" 07. Xena: (Thinks) Why am I nervous about my sixth birthday since I met you and Joxer? 08. Xena wondered what on earth Ulysses could have sent her. 09. "Is it just me, Gabby, or can you hear muffled voices?" 10. The latest birthday gift idea from Troys 'R' Us! 11. Iolaus: Herc, do you think we should have cut some air holes in this? Herc? HERC?! 12. Rob: Have we run out of story ideas that fast? 13. Gab: Let's open it! Xena: My dear, you still have a lot to learn. Now go get my sword. 14. Xena: No, Gabby, it's not a real horse. 15. Xena: (spoken aloud) "It's...um...very nice, Gabrielle..."
(Thinks to herself) "There'd better not be anybody hiding in that thing, or else!" 16. Xena: Am I suppose to guess what THIS is? 17. Disclaimer: No Oversized Polynesian-Style Bamboo Horses was harmed during the production of this birthday party. 01. Before the battle, Xena could only hope that "Bobo, the giant bouncing tongs" wouldn't meet the same fate as her old friend, Goliath. 02. Xena: Hey Gabrielle, this nutbread is great! Gabrielle? Gabrielle? 03. Having been shunk in a pre-emptive strike of the surviving Olympian, Lachrimose, Xena choose the weapon in which she would do him in. 04. Are these Prometheus' BBQ tongs? 05. "Come on, Xena - Let us see that TONG! Tong-tong-tong-tong-tong!" 06. Xena, being competitive by nature, takes her Rock, Paper, Scissors games _very_ seriously. 07. I wonder how much I can get for Titan barbecue tongs on Ebay. 09. TPTB: "Not tongs! THONGS!! I want THONGS!! How the h*ll do you expect to rally enough support for a seventh season if we can't boost the ratings back up?!?! I say more lesbians! Less clothing! THAT'S what the people REALLY want to see!!!" ".... And in groundbreaking medical news today, scientists from the IAXS Medical Academy at Athens University have developed a breakthrough new microsurgery technique. As seen here in this lithograph of a gallstone removed from an unnamed merchant prince, healers are now able to ...."
02. Xena: What's a matter handsome? You've never seen a woman with many skills before? 03. Lucy Lawless: Look Mr. Dorn I know you love playing Worf, but the writers who would be willing to write him in have been given the sack, thank God. Michael Dorn: I know, I just wanted to know if you could put in a good word for me with Kevin Sorbo. Majel won't return my calls. I still think Xena would win. 05. "No, I'm not a Saarlat, Worf - but I'll kick your *ss just the same!" 06. 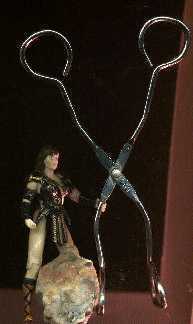 Gabrielle: (offscreen) By the gods, Xena! You've been shrunk and now you have to face some evil goon! Worf: I am not an evil goon, and you will die for dishonoring me so! Xena:Is this the best TBTB could come up with? This guy's no uglier than all the rest I've faced. Oh well. Time for his *ss whoopin. 08. 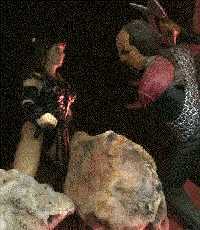 Worf: "I am a warrior; pleasure is nonessential." Xena: "What are you, nuts?"